One of the most devastating fire seasons in the history of the United States began like any other. The 1910 Fires started with smoldering campfires, sparks from locomotives and a few lightning-caused fires. The many small fires grew larger and spread quickly. When the ferocious winds hit in late August, witnesses said the mountains roared. As flames swallowed up the mountains and valleys around them, the 200 residents of Taft rolled whiskey barrels into the street and dismissed the young forest rangers trying to recruit them to help save their town. Finally facing the deadly threat of the fires, most of these people quickly boarded trains for Missoula, leaving their emptied town in flames. 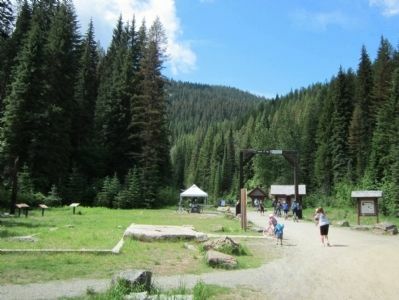 Erected 2010 by Lolo National Forest. Location. 47° 23.785′ N, 115° 38.096′ W. Marker is in East Portal, Montana, in Mineral County. Marker can be reached from Rainy Creek Road (Federal Road 506) 2 miles south of Exit 5 (Taft) (Interstate 90). Touch for map. 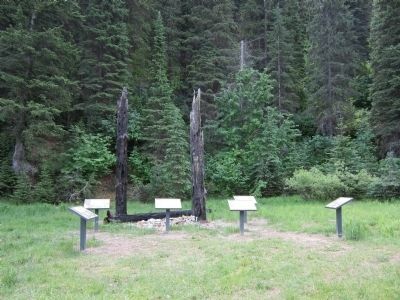 Located at the Route of the Hiawatha Trailhead. Marker is in this post office area: Saltese MT 59867, United States of America. Touch for directions. Other nearby markers. At least 8 other markers are within walking distance of this marker. A Battle That Could Not Be Won (here, next to this marker); An Unlikely Safe Haven (a few steps from this marker); Building From the Ashes (a few steps from this marker); Pluck and Good Fortune (a few steps from this marker); Douse the Flames and Climb Aboard (a few steps from this marker); Life Along the Line (a few steps from this marker); Substation 13 (within shouting distance of this marker); The Route of the Hiawatha (within shouting distance of this marker). Touch for a list and map of all markers in East Portal. More about this marker. 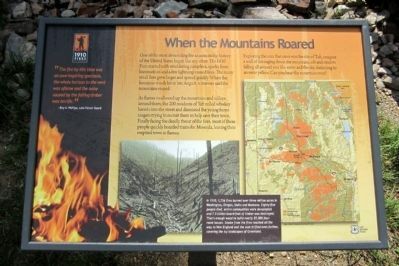 On the bottom are a map & photo with the caption, "In 1910, 1,736 fires burned over three million acres in Washington, Oregon, Idaho and Montana. Eighty-five people died, entire communities were devastated and 7.5 billion board-feet of timber was destroyed. That’s enough wood to build nearly 55,000 four-room houses. Smoke from the fires reached all the way to New England and the soot drifted even further, covering the icy landscapes of Greenland." More. Search the internet for When the Mountains Roared. Credits. This page was last revised on June 16, 2016. This page originally submitted on August 3, 2011, by Bernard Fisher of Mechanicsville, Virginia. This page has been viewed 500 times since then and 4 times this year. Photos: 1, 2, 3. submitted on August 3, 2011, by Bernard Fisher of Mechanicsville, Virginia.